Jarryd Hayne is one of the very best rugby league players in Australia. He was just awarded the Dally M Medal, given to the "best and fairest" in the Australian National Rugby League, for the second time in his career. The Parramatta Eels fullback is one of the highest paid players in the NRL, making a million dollars per season, and is also a regular for the Australian national rugby league team. Today Hayne announced that he is giving it all up to pursue a career in the NFL. He has had a flirtation with the NFL throughout the summer. In July, Lions running back Reggie Bush, who was visiting Australia, told Yahoo!7 that Hayne could play in the NFL, and last month he visited the facilities of the Seattle Seahawks. He is one of the fastest players in the NRL, and said at his retirement press conference that the "easiest transition" to the NFL would be as a punt or kick returner. Hayne is 6'2" and 220 pounds, so wide receiver or tight end (if he bulked up a bit) are also options. He has yet to sign with an NFL team, but given that he just visited Seattle there is speculation that he will sign onto the Seahawks practice squad. 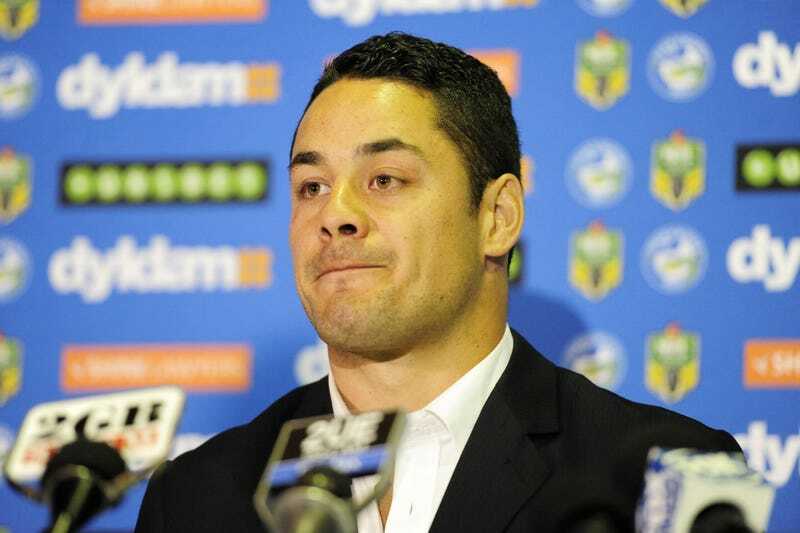 In an open letter t0 fans posted on the Eels website, Hayne said that he has been considering the move for the past two years, and the 26-year-old felt that time was running out for him to try. If he fails to catch-on in the NFL, Hayne still has a pretty good back-up option; he signed a lifetime agreement with the Eels, and the club chairman said "our door is always open for Jarryd to return."